Robert Lewandowski and Paco Alcacer are the men at the sharp end of Bayern Munich and Borussia Dortmund tasked with the hardest job in football: putting the ball in the back of the net. They will engage in a thrilling duel at distance in Saturday's Klassiker — bundesliga.com puts the free-scoring pair under the microscope. The two formidable forwards will find themselves on the same pitch on Saturday evening, but took quite different routes to the Signal Iduna Park. Lewandowski's path has been linear. A great white shark in the goldfish bowl of the Polish Ekstraklasa with Lech Poznan, he arrived at Dortmund in 2010 with a reputation to make. Firstly, he had to cope with having Lucas Barrios ahead of him as first-choice central striker; then had to prove he could fill the boots of the prolific Paraguayan when Barrios departed in 2012. His summer 2013 switch to Bayern suggests he was much more than adequate. Watch: How do Klassiker sharpshooters Lewandowski and Alcacer match up? Alcacer's case is different. The Spain international forward has a reputation to re-build, or rather, show he can compete — and score — consistently at the very highest level. After starring for Valencia, he took on the challenge of succeeding at Barcelona in 2016. There is no shame in failing to take the place of Luis Suarez in the blaugrana line-up, and he may still do so long term — remember, he is only on loan at Dortmund for now — but last season raised question marks over just how good he can be. In a BVB shirt, he's already started answering them. Lewandowski's stint in the Dortmund antechamber waiting for the chance to play as the lone central striker has been to his — and Bayern's — benefit. With Barrios ahead of him, he honed his ability to be part of the build-up play, setting him up perfectly for the role he plays in Munich, which combines both maker and taker. The five goals and three assists Lewandowski has registered this season mean he has been involved in more goals than Alcacer, who has struck seven but is yet to directly tee one up for a BVB teammate. Not that Lucien Favre is complaining. Lewandowski has been the bogeyman of Bundesliga defenders for over eight years, and particularly in the last three, has been remorselessly consistent hitting 30 goals twice and 29 last season. His five goals have come at a rate of one every 160 minutes this season, a healthy ratio for mere mortals, downright leisurely for a man of Lewandowski's prodigious powers. Bayern's teething troubles in the infancy of the campaign are as much to blame as anything as else as no-one in their right mind — and least of all Dortmund, who have seen him score ten times in eight meetings with them — would write off a man who has been the Bundesliga's leading scorer on three occasions already. 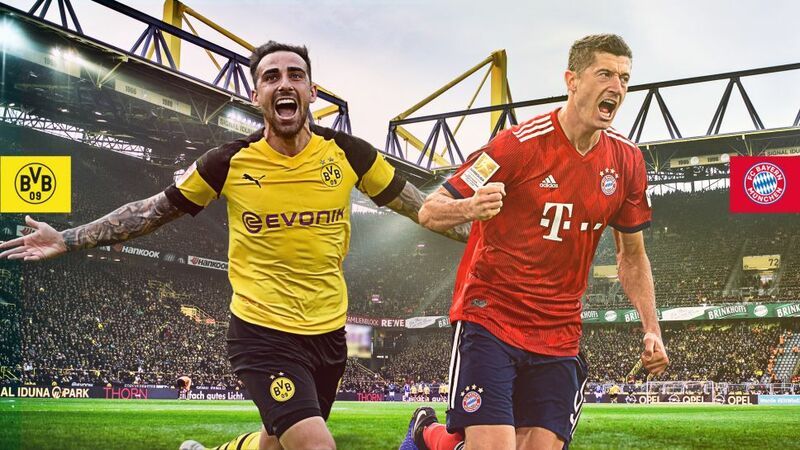 Last summer, Lewandowski would have been many people's favourite to claim that crown again, but if Alcacer continues at his current rate, the Bayern man will be powerless to prevent the Torjägerkanone going the Dortmund man's way. While Alcacer is "a team player" according to Marco Reus, the Dortmund captain also noted the Spaniard is "a clinical finisher". With a goal every 29 minutes (yes, we know — amazing!) on the pitch, Alcacer has set an all-time Bundesliga record, and proven Reus right. How well will training every day against Lewandowski prepare the Bayern back four for the challenge of bringing Alcacer to heel? Click here for the Klassiker Match Centre!